You don’t always believe it, nor do you want to, but your past definitely has a profound way of shaping your future, and even your present for that matter. Lately I have been spending a lot of time (and money) attempting to release some very stubborn neurons in my brain and actually begin to understand why I behave in the ways that I do. It’s been extremely interesting for me to take the time to actually learn about myself in this manner. In a short period of time, I have learned that a lot of those infamous quirks that I have aren’t so random after all. I think that it is really easy to lose sight of your past, especially as you age. I don’t hardly remember anything from grade school, or even much of high school for that matter. Our society is so future-focused that I think we tend to spend so much energy looking forward that we misplace most of our past in the process.But our past is what has shaped our present. Everyone knows this, yet many don’t take the time to heed such a notion. Far back to those days of diapers and diaper rashes, we were impressionable learning mechanisms, soaking in every movement and every word from the immediate, gigantic world around us. We learned from those around us and strived to replicate everything in our paths. I have a two-year-old niece who has learned how to successfully push her very own (borrowed) wheelchair and transfer herself into a car the same way that I do. In fact, she learned how to walk by holding onto my chair behind in a wobbly standing position as she “pushed” me to our destination. Because of me, she is learning about wheelchairs and differences without any force. 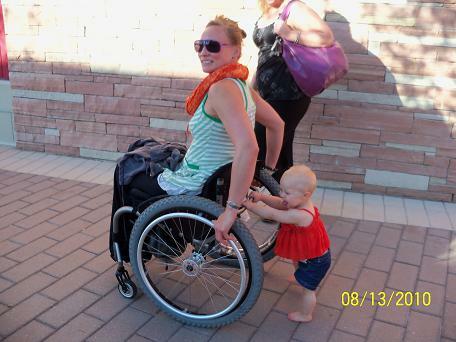 She is learning how others live their lives and challenge their days, whether she wants to or not. In the same fashion, we have grown up learning in equal darknesses. We have been exposed to racism, to neglect, to impossibility, and to discouragement. Sadly, these are the sorts of things from our pasts that tend to carry through to our present and future selves. These are the things that seemingly come out of nowhere and challenge our daily actions and sanities. No matter the cause and no matter the lesson, your past certainly plays an important role in your current life. The best thing to do is to grab a shovel and start digging into those memories that might as well have otherwise been lost to the Universe. Those memories are crucial to your own growth and propulsion as you carry out your dreams and goals, and that thing called life. This post is so nice and interesting.